Puerto Rico remains without power and short on supplies after being slammed by Hurricanes Irma and Maria. Officials are having difficulty even communicating with outlying towns that were devastated by the storm, and the humanitarian crisis is growing. After focusing for days, at least publicly, on NFL protests and other matters, President Trump tweeted about the crisis in Puerto Rico on Monday night — and seemed to blame Puerto Rico in part for its own misfortune. Trump's tweets: "Texas & Florida are doing great but Puerto Rico, which was already suffering from broken infrastructure & massive debt, is in deep trouble....It's old electrical grid, which was in terrible shape, was devastated. Much of the Island was destroyed, with billions of dollars....owed to Wall Street and the banks which, sadly, must be dealt with. Food, water and medical are top priorities - and doing well. 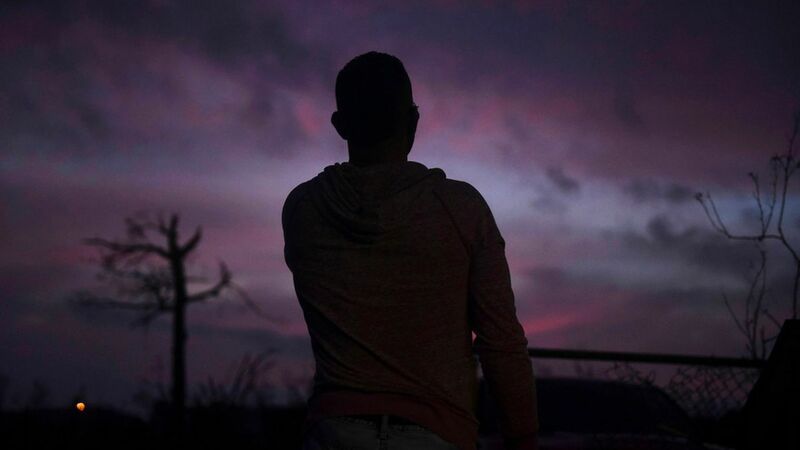 #FEMA"
From Governor Ricardo Rosselló: "We are U.S. citizens that just a few weeks ago went to the aid of other U.S. citizens even as we're going through our fiscal downturn and as we were hit by another storm…Now, we've been essentially devastated. Complete destruction of the power infrastructure, severe destruction of the housing infrastructure, food and water are needed. My petition is that we were there once for our brothers and sisters, our other U.S. citizens, now it's time that U.S. citizens in Puerto Rico are taken care of adequately, properly." From Manati mayor Jose Sanchez Gonzalez: "Hysteria is starting to spread. The hospital is about to collapse. It's at capacity," he said, crying. "We need someone to help us immediately." Government officials said Sunday a dam on the Western part of the island "will collapse at any time." Eastern areas, which were hit by the eye of the storm, could take years to recover. Officials estimate it could take up to 6 months to restore power to the whole island. Federal agencies have cleared the Port of San Juan for daytime operations, but accessing Puerto Rico is pretty difficult right now — airports and harbors are severely damaged and the whole island remains out of power. 11 ships have delivered 1.6 million gallons of water, 23,000 cots, dozens of generators and food, per the AP. Many hospital patients are being flown to the U.S. mainland for treatment. The death toll is at least 10 in Puerto Rico, and 31 if you include other Caribbean islands, per the AP. 1,360 of the island's 1,600 cell towers are down. 85% of phone and internet cables were knocked out. When locals see outsiders, the first thing they ask is "Are you FEMA?" per The Washington Post. "Nothing's working, we don't hear from anyone…We feel abandoned," Toa Baja resident Johanna Ortega told USAToday. Food at local grocery stores is "VERY LIMITED," San Juan resident Claudia Batista messaged Axios. Batista described the situation in San Juan as "desperate times," saying because of "all the material loss, people are losing control and patience and are stealing in other homes and assaulting people on the streets." FEMA teams were in Puerto Rico earlier this month following Hurricane Irma, and as soon as Hurricane Maria's winds died down they launched search-and-rescue missions, per USAToday. All of the 28 task force teams around the U.S. have been recruited to help, which is rare, per Karl Lee, a FEMA Incident Support Team member. FEMA responders are using a San Juan hotel as a command center. 4,000 U.S. Army Reserve members have also been deployed to the island. The Army Corps of Engineers dispatched the 249th Engineer Battalion, per CNN. Trump declared a major disaster in Puerto Rico and said all of the U.S. government is behind the relief efforts. White House adviser Tom Bossert and FEMA's chief are heading to Puerto Rico Monday, although a trip from Trump isn't expected for a while, per CNN. Rosselló thanked Trump on Monday for having federal emergency assistance provided, per the AP, noting FEMA has done a "phenomenal job." OneAmericaAppeal.org, which was launched along with Unidos por Puerto Rico, with all five of the living former U.S. presidents, is now extending its donations to include Puerto Rico and the U.S. Virgin Islands.